It’s not really, you’re just confused. Confused, reluctant, jaded, frustrated. Pick a word, any will do. The truth is, making money online is not as hard as most people make it out to be… on a small scale. More on that in a sec. The “gurus” tell you to build this massive funnel with upsells and downsells. They tell you to spend weeks, or even months, to create your own products so you can get 100% of the sale. They tell you to build out a 30-email autoresponder sequence with built-in self-segmentation and automation triggers. They’re literally confusing the heck outta 90% of “beginner” internet marketers. I put quotes around the word beginner because most “beginners” know just as much as the successful marketers know. The difference is, the successful marketers put what they know into action. That’s lesson number one. Do something. ANYTHING. You’ll learn way more by screwing stuff up than you ever will just reading this post. I try to give you actionable case studies/money-making methods every week here on my blog that you can take and make money with. Recently, someone wrote in and said what I taught was too technical. There wasn’t enough info for “beginners”. Maybe he’s right. I’m a technical guy. So I’ll fix that problem right now. This post you’re reading right here… is for “beginners”. No more excuses friends. I’ve used what I’m about to teach you in more than FIVE different niche markets to successfully make QUICK money as an affiliate. No products of my own. No list from the start. No experience or expertise in the niche markets. No content of my own. Completely from scratch. Starting with nothing. It’s my number one recommendation for anyone just getting started online. This is what I would tell her to do. Same goes for my 13-year-old son. And it’s WAAAY easier than you might think. Contrary to the 17-step funnels and org-charts the gurus are blabbering on about. This is all you need. Is this a million dollar per year business? Probably not. But it could be. It’s easily a six-figure per year business. EASILY. That’s what I meant earlier when I said on a small scale. Million dollar businesses aren’t born. They’re built one step at a time. What I’m sharing with you today is step 1. But the awesome part is, step 1 is stand-alone and by itself can generate hundreds of thousands of dollars. And, I’m gonna do you one better. Instead of just telling you how to do it. I’m going to give you an example of how I would do it using a real niche. So, by the end of this post, you’ll actually have everything you need to get started in a brand new niche and you could be making money in as little as two hours from now… or sooner! As you might’ve guessed, the 1-page website is a squeeze page or your lead capture page. You can download my highest converting squeeze page template here. Now, technically that’s the only page you need. But I recommend that you have a thank you page too. Then it turns into a “2-Page Website”. The thank you page is where your visitors are sent after they opt-in to your squeeze page. Your email service provider (like Aweber) has a default thank you page that you can use if you don’t want to make your own. That’s totally fine. Then I’ll include banners for two to three closely related affiliate products. So, to illustrate how this works I’m going to choose a niche I know nothing about and build out the business for you. I’m heading over to Clickbank to find a niche… I’ll be right back. Still looking… still looking… still looking… Ok… found one. Photo Editing is the niche. My wife is a photographer but I know nothing about photography or photo editing. I know how to resize and crop photos using PicMonkey… that’s about it. If you’re interested in knowing how I chose that niche. It’s simple really. I went to Clickbank, browsed through the categories, and chose one that seemed interesting. I picked Photography under the Arts & Entertainment category. Then I saw the top few offers were about photo editing and had a pretty decent Gravity. Gravity is a Clickbank metric that tells you about how many affiliates have made sales of that product in the last week’s time. 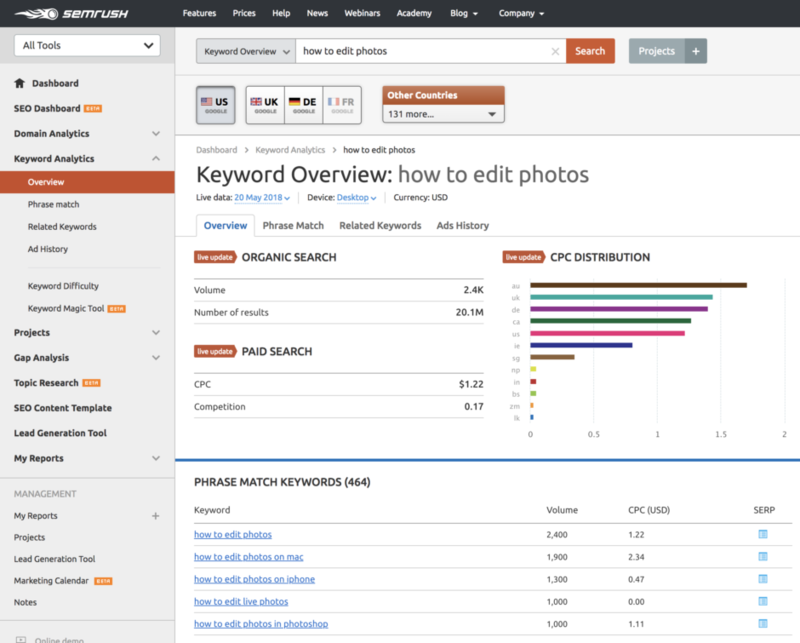 To confirm that the niche is large enough, I went over to SEMrush and typed in “how to edit photos”. While that specific keyword isn’t very high (2,400 searches per month), there are many other closely related keywords that total well over 100,000 searches per month. I try to choose niches that at least total up to 40,000 searches per month or more. You’ll see why shortly. That’s not to say you can’t make money in a niche with lower searches than that. I just choose not to spend my time in those niches. My first step is to dig a little deeper into the keywords and find one with a decent search volume that I can use to build a lead magnet around. A lead magnet is what you give away on your squeeze page for free. This is usually a digital report, a video, a recording, a webinar, software or a tool, etc. I like digital reports. They don’t need to belong. Actually, the shorter the better. I’ve given away 1-page printable guides before with great success. So now I’ll head back over to the keyword tool and see what I can find. Most of the top searches were for people looking for online photo editors. What I would do is put together a list of as many online photo editors as I could find and do a little review of each one. I wouldn’t actually do this myself. I’d go to TextBroker and have someone do it for me. Depending on how many editors there are I would call it something like, “Expert Photographer Reveals The Top 10 Free Online Photo Editors and Why They’re The Best”. I’d spend some time making that title better but you get the idea. You could get someone on TextBroker to write that guide for $20 or less. I’d use the squeeze page template I gave you access to above and include an image of the guide. I sometimes create the cover images myself or I’ll get someone on Fiverr to do them for me. Depends on how quick I need it done. My guy on Fiverr requires a 3 day lead time and I’m just impatient sometimes. I like to get campaigns up and going while they’re hot in my mind. Next would be the thank you page. For this, I just use a plain white web page with the message at the top like I said above and a few banner graphics promoting related Clickbank products below it. Nothing fancy here. Just make sure the products are closely related. This is one reason why I start my research at Clickbank. What’s important to realize here is, I’m not building a business around a Clickbank product. I’m building it around a problem people need solved. Products come and go on a daily basis. I try to enter niches that are as evergreen as possible so I don’t have to constantly be updating my businesses. That’s all the work that goes into building the website. The rest is all done via email. And it’s a lot easier than you think. Forget about those 30-email autoresponder series with intricate paths and confusing automation. You just need to start with a simple 3-email autoresponder series that delivers value while subtly pitching an affiliate product. Email #1 simply gives them the guide. You can attach it directly to the email. No need to create a download page. You could upload the guide to your host and just direct link to it as well. That’s up to you. Another note, I usually put a few links throughout my lead magnet promoting affiliate products too. That’s just a few places. Get creative. Don’t be afraid to send people somewhere else online if it’s going to be valuable to them. They’ll look at you as an authority. Email #3 should deliver value while at the same time selling something. The ideal way to do this would be to find an affiliate offer where the seller gives you links to presell pages for their product. A great example of this is any product of Mike Geary’s. He has some great presell pages that deliver value and at the end promote a product. Many vendors on Clickbank are realizing how effective this is for their affiliates. They know the affiliate needs to deliver some kind of value in every email they send so they’re giving them that option. After the 3rd email, it’s up to you to mail out relevant broadcasts to your list on a regular basis. The frequency depends on the niche. In the gardening niche, we do twice a week. It’s up to you and it depends on how much time you want to put into delivering value in each email. You honestly don’t have to create any content whatsoever. You can just do a “roundup” of good stuff you’ve found online since your last email and send people to those sites. I’ve done this as an affiliate before and it works great. I would include one or two product promotions in each email and anywhere from six to ten pieces of relevant content. As far as traffic goes, I always start with Bing PPC. It’s cheap. It’s highly targeted. They’re cool with sending traffic to a squeeze page. And the traffic converts into sales. That’s it. That’s how simple this business model is. It centers around building a list of people who have a specific problem they need solved. Of course, everyone won’t turn into a buyer but once they’re on your list and you continue to deliver value to them, your chances of them buying a product you recommend goes way up. The beauty of this business model is you typically get to build a list for free because you’ll start earning commissions right away and they’ll usually be enough to cover your ad spend. It’s a great little business model. Simple to set up and simple to maintain. If you want to learn more about how to set up and run a successful email business, you should check out my Newsletter Academy training.